Cooking is considered a very much indoors work. Not many people actually cook in the outdoors except for some campfire barbeque. Interestingly, GSI Outdoors does not think it needs to be like that. They have many products for spending quality time in the outdoors including pressure cookers. Started in 1985 as a small outdoor equipment manufacturing company in San Diego, today GSI has a wide range of outdoor products, but one of the most intriguing ones are the GSI Pressure cookers. The Halulite pressure cooker is the popular brand from GSI. It comes in two models of varying capacities. The Model# 40503 is the smaller one with 2.8 litre capacity. The model# 40506 is the larger one with 5.8 litre capacity. Halulite, in fact is an ultra-light but hard anodised alloy which is ideal for tough use like the outdoors. The Halulite alloy is comparable to titanium when it comes to the combination of toughness and lightness. It is completely scratchproof making it perfect for outdoor use. The metal also does not get affected by abrasions or burn circles. You can carry a new looking cookware almost everywhere you want to go. The alloy is also great conductor of heat delivering the heat uniformly to all portions of the cooker to cook your food evenly. The alloy itself is non-reacting and tough. As a result, there is no need to have any special coating on the body to make it look better or increase its durability. This is a big plus with this product. Most times, the coating material is tough, but it can easily get peeled off, exposing the inner material reducing the life of the cooker – but not with Halulite. Inside the cooker is anodised aluminum material which is a popular material for many of the top pressure cooker brands. However, Halulite is a GSI proprietary solution, so you are not going to get these benefits from any other cooker manufacturer. 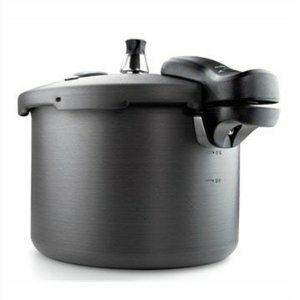 This 5.8 litre pressure cooker weighs around 4 pounds and measures approximately 14” X 10” X 8”. It is made from GSI proprietary Halulite alloy and designed for car camping needs. The Halulite material provides this cooker with a lot of toughness, ruggedness along with amazing efficiency of heating and uniformity of heating. The light material and the compact design means that this cooker can be carried along very easily and stowed away at the campsite, without occupying a lot of space. While efficient cooking is important, the storage is a critical factor when it comes to camping sites. The cooker comes with a triple safety lock system. This ensures that the cooker stays locked till all the steam pressure inside is reduced. Thus, the design makes for extremely safe cooking. This is vital for outdoor cooking where emergency help may not be always handy. There are multiple pressure release values. So even if one of the valves get chocked with some food particle, the unnecessary pressure will not build within the cooker. Thanks to all these features, this GSI pressure cooker can reduce the average outdoor cooking time by as much as 66%. This reduced time means, less fuel to burn, faster food and lower pollution. Thus this is a quick and the same time green way to camp. This pressure cooker is just a miniature replica of the 5.8 model. All the features and design details of this model are identical to the larger model. The only difference between the two is the capacity and hence the size. This cooker weighs just over 2 pounds and measures approximately 12” X 8” X 6”. Due to its smaller size this cooker is suitable for car camping as well as gourmet backpacking. The small size and light weight mean that you can actually pack this in your regular backpack while going for hiking. As you can see, efficient pressure cooking is not just something you must do at home. Thanks to GSI pressure cookers, you can now take your pressure cooker culinary skills out for camping too. Besides, these cookers come with a good cookbook that has loads of recipes, tips and useful information regarding campsite cooking.